Festoons are areas of swollen skin in the cheek region that are typically associated with aging, sun exposure, and genetics. Eyelid bags and festoons are both age-related and often exist together, which can make it difficult to distinguish them. Laser skin resurfacing, radiofrequency, and some creams may improve the appearance of festoons, although surgery has a higher success rate. According to the American Society for Aesthetic Plastic Surgery (ASAPS), blepharoplasty (cosmetic eyelid surgery) was the fourth most frequently performed cosmetic surgery in 2012 and the most common in people aged 51 to 64. This is hardly surprising, considering that the face, particularly the area around the eyes, can make all the difference between a youthful and an aging look. In this article, we will be covering a very common problem in this area, malar festoons. The term “festoon” is thought to originate from the Italian word “festone”, which is a decoration that is hung between two points, sagging in the middle. Similarly, eyelid festoons look like a puffy area of the skin below the eyes, sagging at the junction between the lower eyelid and the cheek. Festoons (also called malar festoons) develop when the muscles below the eye — particularly the orbicularis oculi muscle which closes the eye — begin to weaken and degenerate. The loss of muscle action causes the soft tissues in the area to slide downwards, pulling the skin. Fat and fluid may also begin to accumulate in the area, giving the festoon its characteristic puffy appearance. Scientists don’t know what exactly causes the muscles to weaken, but hypothesize that a number of factors including sun damage, gravity, and age-related muscle attenuation are contributing elements. “Festoons develop due to reasons such as genetics, sun damage, aging, and poor lymph drainage. As a result, over time the structural area below the surface of the eyelid experiences damage to the elastic fibers causing the skin to weaken, leading to a gap where swelling or puffiness can occur,” says Orange County-based plastic surgeon Dr. Joseph Cruise. There is an important distinction to be made here: festoons are not the same as eyelid bags, even though they may look very similar. Festoons extend from the lower eyelid to the cheek, with the cheek portion being larger. On the other hand, eyelid bags do not extend to the cheek and generally feel firmer than festoons. Eyelid bags and festoons are both age-related and often exist together, which can make it difficult to distinguish them. “Malar mounds” is a term that is often used interchangeably with festoons, but is technically a lesser degree of swelling with less puffiness and skin sagging. According to Dr. Cruise, extreme cases can cause problems with peripheral vision. A number of surgical and non-surgical approaches exist; there is no single method that produces optimal results in all cases, but in some cases surgery may be avoided through the use of topical creams energy-based treatments. The following info, along with a consultation with your physician, will help you make an informed decision. Damage caused by sun exposure is one factor that contributes to festoon development. Protecting yourself from excessive sun exposure can prevent or slow down their development. It is important to note that no amount of sunscreen will treat festoons that already exist. At best, sunscreen may prevent festoons from developing or stop them from getting worse. You can refer to Zwivel’s guide on how to choose a sunscreen for more information on the subject. Tretinoin cream (sold under the name Retin-A) is most commonly used for wrinkles or acne treatment, but some doctors recommend it to treat festoons as well. Studies have shown that tretinoin can increase collagen synthesis in sun-damaged skin. However, there is a lack of studies evaluating the efficacy of tretinoin in treating festoons specifically. There is no consensus on whether festoons actually benefit from tretinoin treatment. If it does cause an improvement, it’s unlikely to be dramatic. Furthermore, tretinoin can cause skin irritation, limiting the potential for its long-term use. It may seem like a futuristic idea, but laser resurfacing is an established treatment modality for various skin conditions. It works by inducing a minor controlled injury to the skin, which stimulates it to make more collagen and return to a tighter, healthier-looking state. While laser resurfacing can improve festoons, it is rarely curative. The results achieved with it are often inferior to surgery, and the recovery period can sometimes be even longer than that of surgery. The preferred type of laser in festoon treatment is CO2 laser. 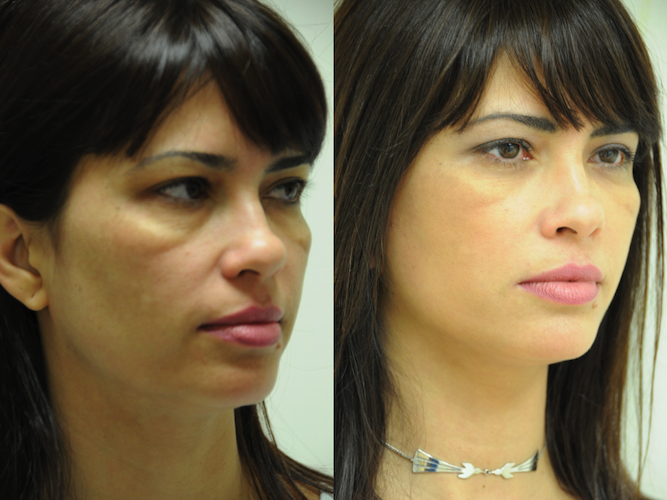 See real patients’ results in our gallery of before and after laser resurfacing pictures. The concept behind radiofrequency therapy is somewhat similar to laser resurfacing—induction of a controlled injury which the body attempts to heal, resulting in tighter skin. The difference is that rather than using a laser, a device which emits radio frequencies that have a heating effect is used instead. Radiofrequency therapy shares similar limitations with laser treatment but has a much shorter recovery period. A chemical peel is a substance that can be applied to the skin, causing it to blister and peel off. The new skin that grows in its place should be tighter and smoother. Some doctors recommend chemical peels for mild festoons. Hyaluronic acid (HA) is a multi-purpose injectable filler, and some doctors recommend it for filling the edges around very mild festoons in the effort to conceal them. HA injections do not treat the festoon, but rather reduce the contrast between it and the surrounding area, making it less visible. The problem is that hyaluronic acid can, in some cases, make festoons worse. People who undergo HA injections might also develop new festoons after it. Fortunately, a substance called hyaluronidase can easily be injected into the festoon to dissolve the HA and remove the swelling if it develops or worsens. Although the previous methods can be effective in some cases, the definitive treatment for festoons is surgery. Beverly Hills plastic surgeon Dr. Renato Calabria. Festoons are among the more difficult problems to treat, so choosing an experienced surgeon with proven results can make a big difference in outcomes. People who have both eyelid bags and festoons are advised to have them treated together, as removing only the eyelid bags can accentuate the appearance of festoons. In this operation, the surgeon makes an incision at the top of the lower lids, parallel to the lash line, and advances downward internally (without further external incisions) until he reaches the bones of the cheek. This separates the soft tissue which makes up the festoon (muscle, fat, and ligaments) from the bone. The redundant part of the muscle and fat pockets (if present) are then excised and the remaining muscle and ligaments sutured and anchored to their normal attachment points. The excess skin is also removed. Finally, the initial skin incision is closed and hidden in natural skin folds to better conceal it. “Fortunately, when festoon surgery is performed by an experienced plastic surgeon, other than the dramatic improvement in the appearance of the lower eyelids, there is little to no sign surgery was performed because the scar is so well hidden in the lower lash line,” says Dr. Cruise. The skin sutures may be removed approximately one week after the surgery. Recovery may take a few weeks, and you might notice some redness or swelling over this period. You may need to apply artificial tears and/or ointment to protect your eye while in the recovery stage. The procedure can be performed in an outpatient facility under local anesthetic. You can expect to pay anywhere between $2,000 and $7,000 for this operation, depending on the severity of your condition, the experience of the surgeon, and your geographic location. Another surgical technique that is preferred by many surgeons for more extensive festoons is the midface lift or suspension. In this operation, the soft tissue structures of the cheek are released from their normal attachment points and anchored to a point higher up, suspending them in the higher position and eliminating the sagging areas. “The procedure of choice is an endoscopic (a tiny probe with a camera attached to it) midface suspension. Through a small incision in the temple, sutures are placed to anchor the cheek area in a more youthful position, re-draping the skin which causes the malar festoon,” explains Calabria. Since the surgery is performed through a very small incision, recovery is generally quick and uneventful, with only mild bruising and swelling. This procedure can also be performed in an outpatient office with no overnight hospital stay. An endoscopic facelift typically costs from $6,000 to $10,000. People with significant amounts of excess skin can undergo an operation to remove this skin only and possibly some subcutaneous (under the skin) fat as well. The scar from this procedure is generally more visible than those of the previous operations discussed here, but some patients will achieve good results with it nonetheless. This operation is generally cheaper, topping out at roughly $3,000. Malar festoons are a common age-related cosmetic complaint. There are a number of treatment options, including both surgical and more conservative approaches. Surgical options generally achieve much better and more permanent results. The eyes are the most visible part of the body and, unfortunately, one of the areas that causes us the most problems. From malar festoon to dark under eye circles, the region is notorious for blemishes. The following products help to tackle discoloration and puffiness around eyes. 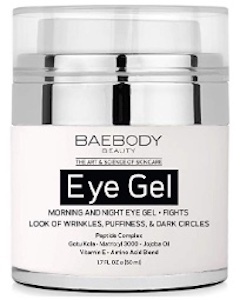 Baebody’s eye gel is an all in one eye treatment that can be used during the day under makeup or at night as a full face cream. Using effective skincare ingredients like hyaluronic acid (HA), aloe vera, and vitamin E, this gel tackles fine lines, eye bags, and puffiness. Baebody also offers a number of other skincare product with discount codes for purchasing multiple facial products. 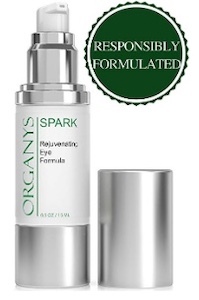 Organys’ Spark anti-aging eye cream uses natural plant based ingredients to reduce eye puffiness and dark circles. This cream can be added to the end of your morning and night regimen to help rejuvenate your skin. Organy’s uses eco-friendly ingredients and packaging for its products and the Spark anti-aging eye cream is not tested on animals. 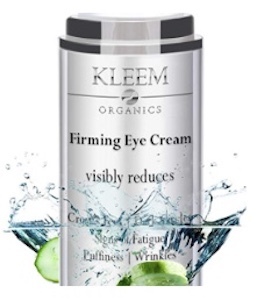 Kleem’s firming eye cream treats under eye bags and puffiness. This cream uses the natural healing power of organic ingredients like aloe, argan oil, and green tea. Using a pea sized amount in the morning and before bed, Kleem’s cream delivers results within a few weeks. 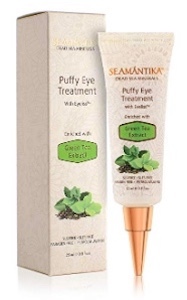 Specifically formulated for treating puffy eyes, Seamantika promises instant results. Simply applying the cream to the eyes for five to seven minutes provides ten hours of lift. Seamantika’s cream is paraben free and not tested on animals. Chemical peels are known to help mild festoons and to rejuvenate the skin. 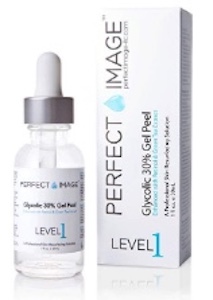 Perfect Image’s acid gel peel can be used across the face for issues like fine lines, age spots, and acne. The peel also includes green tea and chamomile extracts for a natural antioxidant boost to your skincare regimen. Ed Hassan is a newly minted doctor and a contributing health writer for Zwivel.